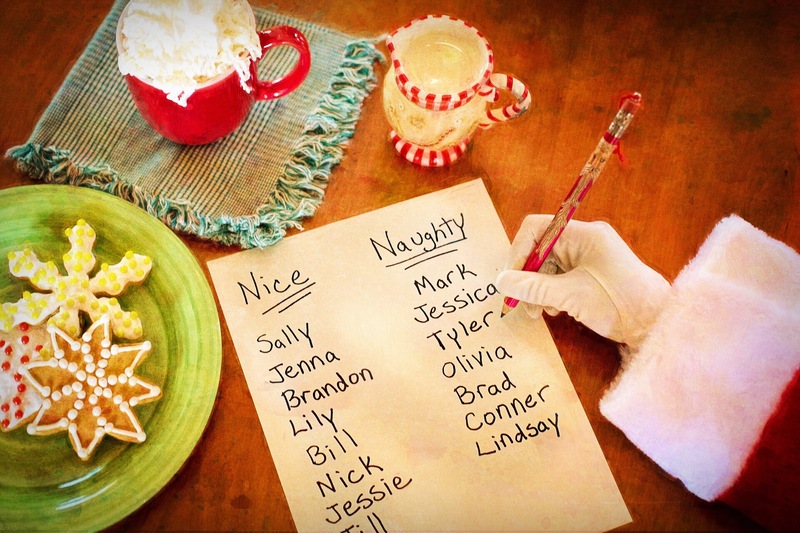 Did you have parents who would threaten to call Santa Claus at this time of the year if you started misbehaving? I sure did! There is no sentence quite as terrifying as “I’m telling Santa you’re being bad” to a youngster. Well, now that I’m the adult (haha, when did that happen!? ), I had my first opportunity to play the “Santa Card” this evening. On my way home from work I decided to call and chat with my cousin, Mandy, about our upcoming day-trip to New York City. She had just picked up her two little boys, Paul (nearly 5) and Ryan (3), from her mom’s and was heading home. However, she needed to make a quick stop at Goodwill to find a sweater she could DIY for her company’s ugly Christmas party. Not wanting to take the boys in with her, she asked if I would meet her at the store (it’s next to my apartment complex). Less than a 5 minute walk later, she was explaining that the boys were watching a movie and she’d only be a few minutes. Easy peasy, I’ve got this! All was fine and dandy until the car turned off – you know, like the 10 minutes you have after turning off the car before the radio goes out. Thinking the boys’ movie would come back on like the radio by turning the key, I gave it a try – unsuccessful, although we were greeted by some lovely Christmas tunes! This is when the boys lost it. At that moment they wanted nothing more to do with “Auntie” and wanted mom now. They began messing with the windows, which I had thought were locked. This wasn’t enough for them – they start chucking little pieces of bread and paper out the widows into the parking lot as I am frantically trying to figure out which buttons control their windows and which button will prevent them from putting them down once more. All the while, I can see Mandy waiting not-so-patiently in line with two sweaters. Finally, FINALLY, I located the right window buttons, and using the boys’ middle names, get them to keep their fingers and toes inside the vehicle. And just like that, the screeching and fake crying begins – “you’re mean. I don’t want you here.” Is that music to all disciplining adults? Ignoring them, I attempt to communicate telepathically with Mandy that her sons are having a meltdown. Although I didn’t get through to her, Scott must have sensed something was up, because he called at that exact moment and inspiration struck! Mandy has completed her transaction and is making her way to the car. Jumping out of the car I quietly and quickly explained the phone call and that her boys might ask about Santa now. She just laughs, finding the whole situation hysterical! Back in the car, she asks her boys about their behavior and our phone call with Santa before proceeding to show me her sweaters. After a few moments, this little voice from the backseat pipes up. Mandy and I just glance at each other and try desperately not to laugh. Who knew playing the Santa Card could be so much fun? !